I loved Lies, Love, and Breakfast at Tiffany's! I didn't realized when I started reading it that it's a companion novel to Lies Jane Austen Told Me. That said, it can be read as a standalone, but I would highly recommend reading both. It's nice to have the background of the supporting characters from the first book. This is the kind of book that is best to start when you've got a day to read. I really didn't want to put it down once I started. I was fascinated by Silvia for many reasons, but her eye (or lack thereof) really made her intriguing. I was quite curious how things like driving would work being sightless on one side. I was concerned for her safety, and imagined her having a car with those blind spot indicators. The author did a great job of including Silvia's vulnerabilities when people sat on her blind side, or approached her on that side. It was really fascinating, and even more so learning at the end of the book that Silvia is based on the author's friend who has one eye. I have pretty horrible vision, but my issues are corrected by glasses or contacts. I can't imagine how difficult certain things would be only having one eye. But, I loved the banter between Silvia and her best friend, Emma. Silvia made the best of her situation and didn't complain about it. She was used to it, and knew how to adjust to succeed in her job and life. I studied video production in college and could relate to the parts of the book that focused on video editing too. I really enjoyed having that additional connection to the book. I'm looking forward to reading this book again, and hope it is available on audio book soon so I can listen to it while I work. I love the way this author writes. There are so many awesome one-liners that had me giggling out loud. This book was a read-in-one-dayer, so it's a good thing I didn't have anything pressing going on. I mean, there's cleaning, but that's not going anywhere. Silvia and Ben were so fun to get to know. They had a chemistry that was visible to the reader from the very beginning. They helped make each other better people... Even if Silvia was a bit clueless at times. I enjoyed the humor thrown in about Audrey-the-eye. Silvia took something challenging from her youth and grew from it. Humor always helps. I did wonder how she was able to drive with one eye. I imagine that's quite a challenge to get used to. A good story not only has strong main characters, but strong supporting characters as well. This book definitely did. Silvia's grandma was a hoot and Emma was the kind of best friend that we should all hope to be. This is definitely a book that is a keeper. 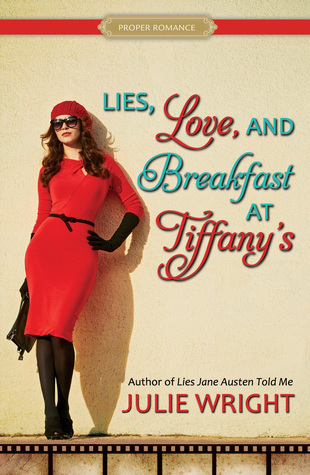 After I started reading Lies, Love, and Breakfast at Tiffany's I was excited to realize that the characters in this are the ones from Lies Jane Austen Told Me. Silvia is back! It can definitely be read without having read Lies Jane Austen Told Me, but honestly, do yourself a favor and read both. This is a very quick read. I was totally taken in for a ride, and I loved it. I will admit that I enjoyed Lies Jane Austen Told Me a little bit more, but this is definitely a book that I will reread and enjoy again and again. I think I didn't like it quite as much because I don't know much about Audrey Hepburn. I've seen maybe two movies of hers, and so I wasn't really able to relate to the story in that way. Ben is a great character, but I swear I almost throttled him at the end of the book. I can't say much without giving anything away, but grr... Serious communication needs to happen. And it does for most of the book, but the end. Oh the end. Okay, it ends well, so the last little bit before the end. Regardless, it was a great read. Loved all the characters, loved the setting, loved the story line. This was a winner.